How to draw Anime Kenpachi Bleach series. In this tutorial, you will learn how to draw an Anime character from Bleach, Kenpachi. This should be easy for every artist to follow. If it is a bit too fast for you, press pause. Then you can keep drawing along. You will find video tutorial on the top. You can scroll down further to see step by step images with instruction. Learn how to draw Manga, Anime, and comics. Drawing and sketching anime technique for manga, cartoon and comics. Learn to draw with tips from Video and step by step tutorial. I usually look at the image and try to break it down into simple geometry shapes. It is a lot easier to draw once you observe the over all shape of the object or person you are trying to draw. I usually start of using circle as a base for character’s skull, then next step would be figuring out the next geometry form to fit into the image. Kenpachi is a muscular Shinigami with a wild and aggressive appearance that fits his personality. He wears a sleeveless captain’s haori that has a ragged look to it (which belonged to the previous captain and was taken after his defeat). He styles his spiked-hair with small bells at its tips and wears a special eyepatch on his right eye, created by the Shinigami Research and Development Institute, to suppress his vast amount of spiritual energy. When he makes his first appearance the eyepatch is more elegant having a gold-like lining and a chain as one of the straps, this changed after his defeat by Ichigo and has since become a normal black eyepatch with normal straps. He has green eyes, pronounced hairless eyebrow ridges and a huge scar running down the left side of his face. 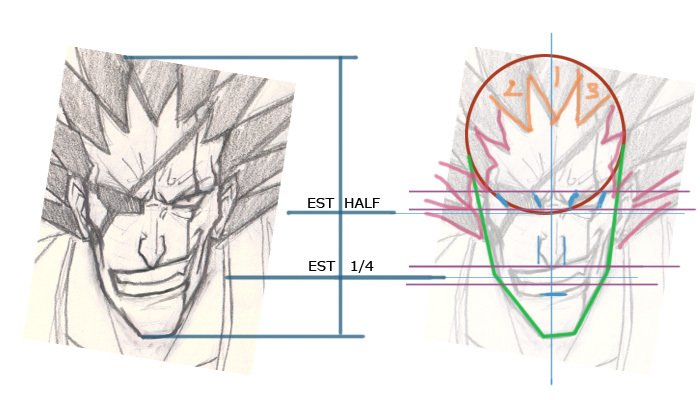 Below is a drawing diagram of Kenpachi’s face break down so it is easier to get the proportion right for beginner. Below are step by step how to draw Manga Kenpachi line by line almost. 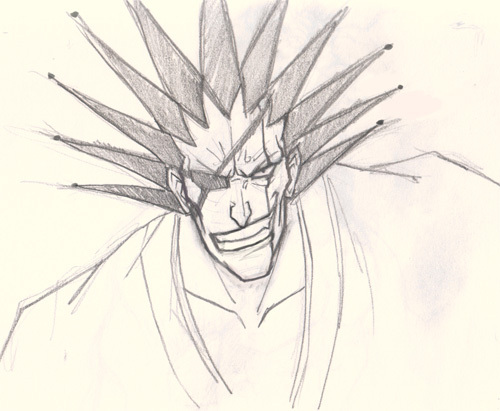 From 1-2) You can see that I just draw basically the base sketch lines for Kenpachi’s head foundation. So that I can us it to build more his facial structure and more detail. 3-4) Once I have the head constructed, I will add vertical line to split the face in half measurement. Then I will draw horizontal line across his face half of the head’s height for establishing eyes’ base. Then I will sketch in eyes, nose and mouth as instruct on the video tutorial. 6-7) I keep refining the base sketch so that all the elements will be at the most accurate positions. Once I have all the foundation sketch in place, I then will start drawing darker line and sketch out additional detail (as seen in 8-9). 10) Now we have the foundation sketch in place, we can finalize drawing and add more detail as instructed in the video.